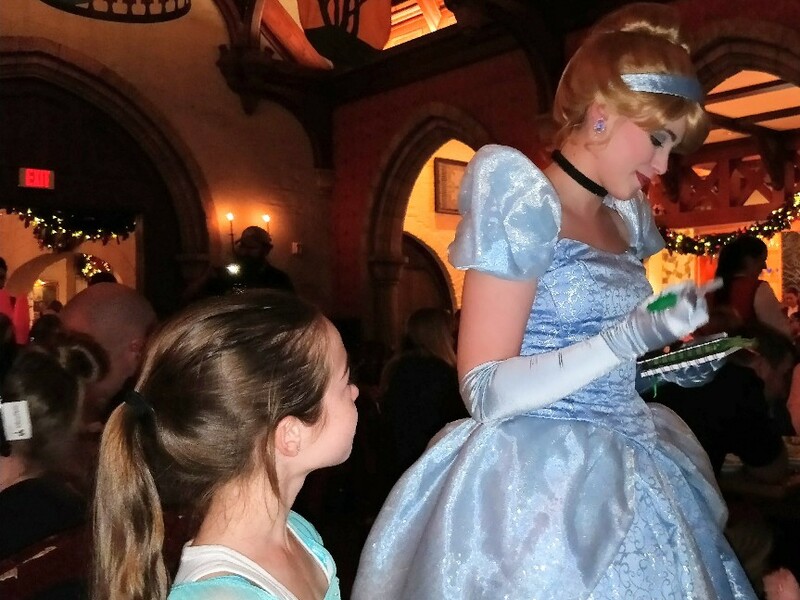 Princess meals are a hot commodity at Disney World. Although Cinderella’s Royal Table is one of the most coveted advanced dining reservations, Akershus Royal Banquet Hall is close behind in popularity. 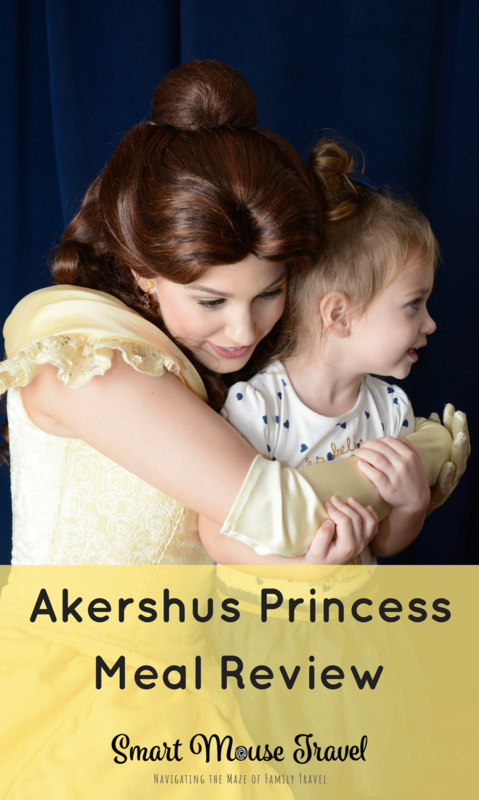 The Akershus princess meal in Epcot allows you to (usually) meet 4 to 5 princesses in the time it takes to eat a meal. Akershus Royal Banquet Hall is located in the Norway pavilion of Epcot’s World Showcase. You can find Akershus Royal Banquet Hall towards the walkway of the same area that houses the Frozen Ever After ride. The Akershus princess meals take place in a large, rustic Norwegian banquet hall. 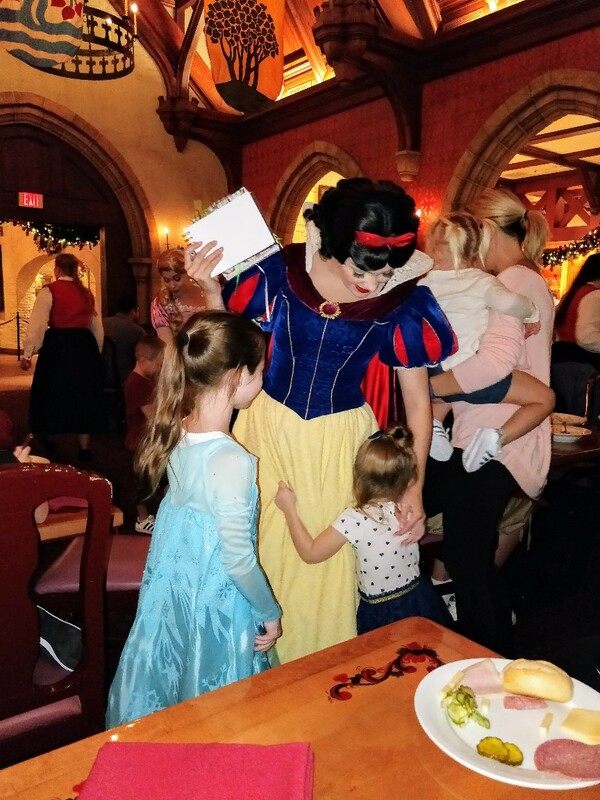 There are several seating areas in Akershus, but don’t worry, the princesses make their way to all the tables during a meal. There are immense arched doorways and carved dark wood details throughout the restaurant. 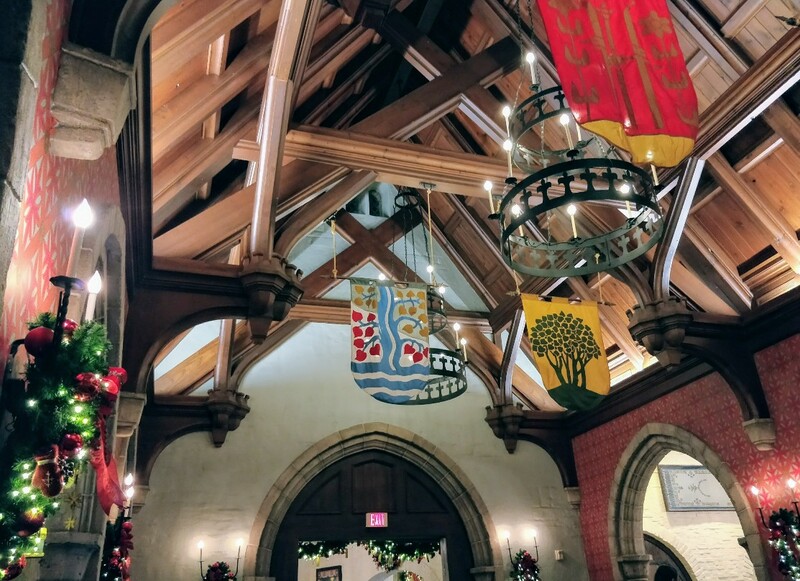 Decorative banners hang from the ceilings in the dining rooms. The lighting is very dim inside Akershus. 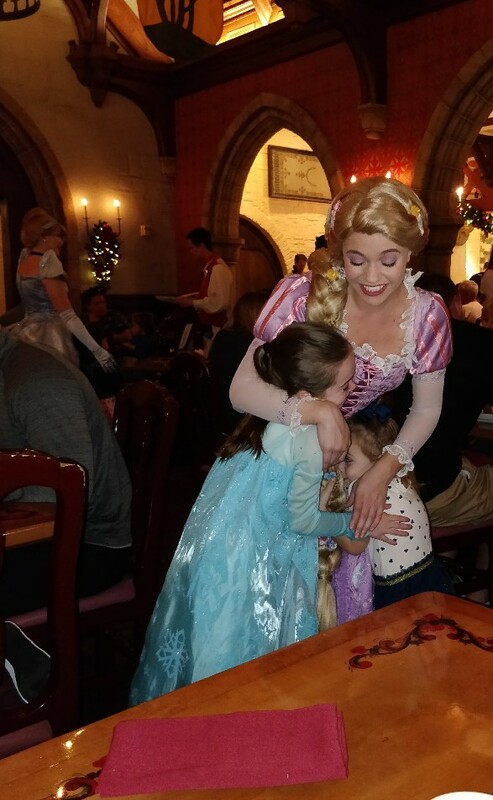 This dim lighting and close tables make photos with the princesses challenging, but the interactions are usually very good. I recommend having your child sit where they can easily get up from their chair to meet the princesses as they come around. If possible, have your family photographer sit across from or next to those hoping to meet the princesses. An Akershus princess meal is a three-course affair for lunch and dinner. First is an all-you-care-to-enjoy Norwegian appetizer buffet. This appetizer buffet has salad, vegetables, fruit, cold cuts, cheeses, and some varieties of smoked fish among other options. Your lunch or dinner main course is plated and brought to the table by your server. The last course is dessert which is brought out family style with three different treats to finish your meal. For those with food allergies: We consulted with our server and the chef before ordering our meal. This way we could ensure Elizabeth’s meal would be safe for her. To avoid cross-contamination, the chef prepared her appetizers in the kitchen and had them brought to the table. Her meal was also specially prepared to avoid her allergen. The normal dessert options were unsafe for Elizabeth so the chef sent out a selection of Enjoy Life cookies for her dessert. If you have someone with a food allergy please read my 5 Minute Guide To Dealing With Food Allergies At Disney to learn more. We have been to Akershus on a few occasions and thought the food was pretty unremarkable. However, on our large family trip in December 2017 we felt the food quality had improved. An Akershus princess dinner is still not fine dining, but we did enjoy our meal. And let’s be honest, we’re here for the princesses anyway. 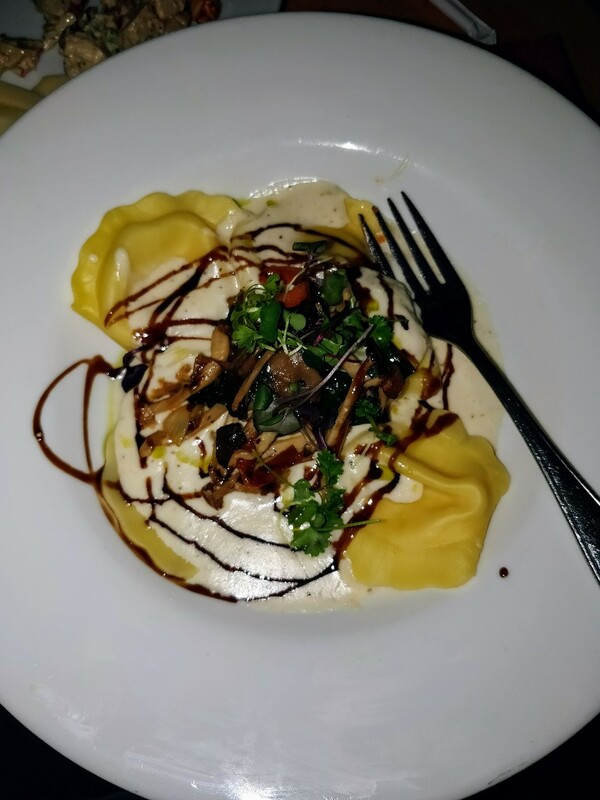 For reference, Elizabeth had grilled salmon, I had the four-cheese stuffed pasta with white wine cream sauce, and Mr. Smart Mouse had a braised pork shank. There are usually 4 or 5 princesses at an Akershus princess meal. We saw Belle, Cinderella, Snow White, Sleeping Beauty, and Rapunzel, but please note characters are always subject to change. In fact, the Disney World website lists Belle, Cinderella, Snow White, Princess Aurora (Sleeping Beauty), and Ariel as the most likely princesses you will encounter at this meal. The princesses are always so sweet and kind. My niece spent most of her interactions hugging each princess’s dress. I thought that the princesses did a great job of interacting with both girls so neither felt left out. During your meal there is a princess processional. The princess processional allows your little one to parade through the restaurant following one of the lovely princesses. My little niece was enthralled with Snow White and that lucky girl somehow managed to walk hand in hand with Snow White during the parade. Before starting your dinner you get to meet Belle in her own greeting area. 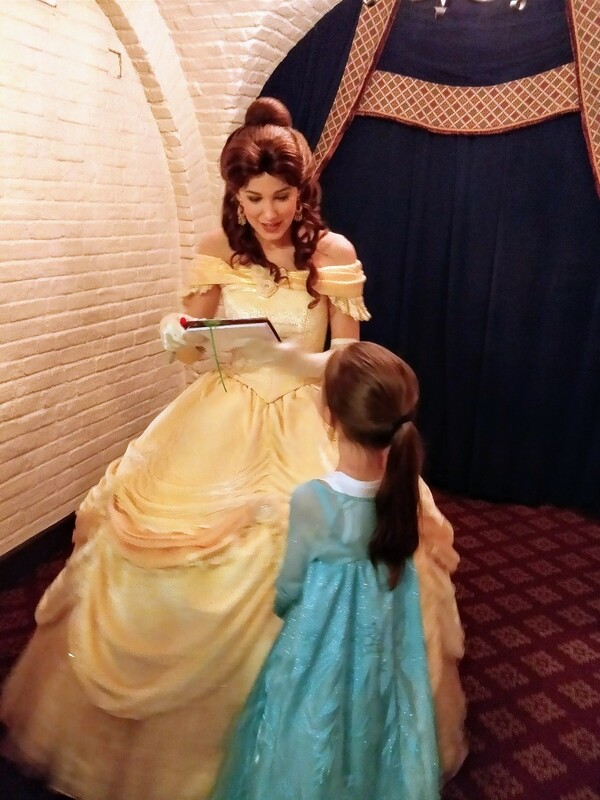 Belle will sign autograph books, talk to your group, and take pictures with you. There is also a PhotoPass photographer at Belle’s meeting spot. Make sure to take advantage of the PhotoPass photographer by getting a family photo with one of our favorite princesses! Sleeping Beauty was the first princess to arrive at our table. She chatted with Elizabeth and Mini Mac for a bit before moving on to the next table. Elizabeth was dressed as Elsa during our Akershus princess meal. Cinderella asked if “Elsa” could freeze the pond so her mouse friends could go ice skating. Rapunzel asked if Elizabeth would share her appetizer vegetables with Pascal (who is Rapunzel’s chameleon friend). Always a favorite of ours, Snow White was so charming and sweet with the girls. The cost according to Disney’s website is $35 – $60 per adult. If you are on the Disney dining plan the Akershus princess meal uses one table service credit. 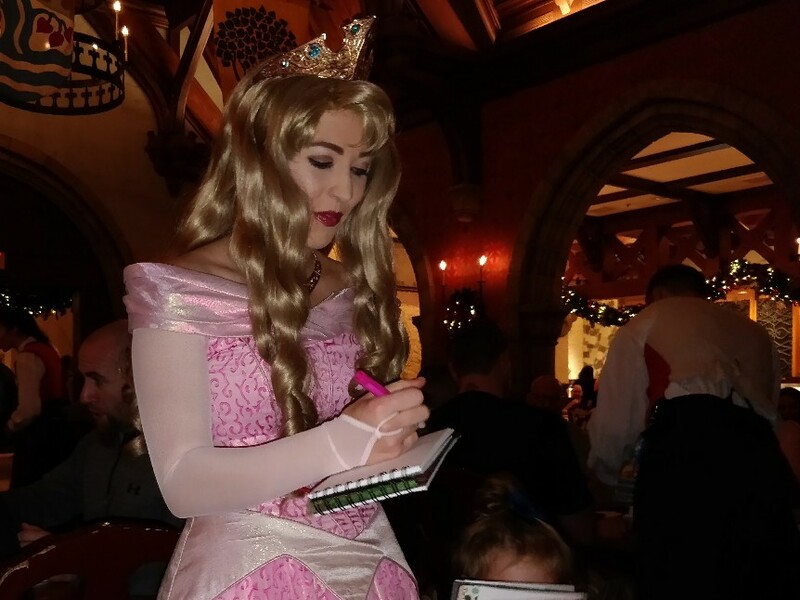 Akershus Royal Banquet Hall is a great option for those looking for a princess character meal. Although Cinderella’s Royal Table is the more popular princess meal I think that Akershus princess meals are a great option. You meet the same number of princesses at either Cinderella’s Royal Table or Akershus Royal Banquet Hall, but Akershus is a less expensive option (in both cash and dining credits). I highly recommend making advance dining reservations for the Akershus princess meal (ideally 180 days in advance). Find out more about making Disney Dining Reservations in this article. Belle is a wonderful host of your meal and each of the other princesses charms those dining at Akershus princess meals. If you are looking for a princess meal I think Akershus Royal Banquet Hall is an excellent choice. 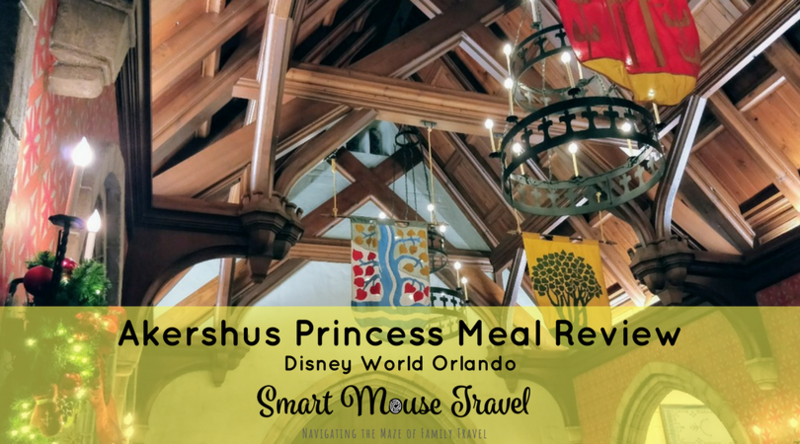 An Akershus princess meal is ideal for those not able to get a reservation at Cinderella’s Royal Table, those who love Belle, or those looking to do a princess meal less expensively than Cinderella’s (although Akershus is still pricey). I love your quote – “you are here for the princess anyway” so true! That pasta does look really good!